The steel towers loom in the distance, like shiny toy soldiers arranged in formation. As our boat approaches, the dizzying size of the machines becomes clear. A few minutes later, I’m standing right next to one, holding the guardrails and craning my head to take it all in. The boat bucks like a rollercoaster as giant waves crash against the bow. Salty spray lashes my eyeballs. I try not to vomit. Up close, the machines are not toy-like at all. They are aliens, fifty-story monoliths, each crowned with three enormous, outstretched blades that dazzle in the morning light of this crisp October day. This is America’s first offshore wind farm—a pilot project compared with the vast offshore energy plants in European waters—but still, a hard-won victory. 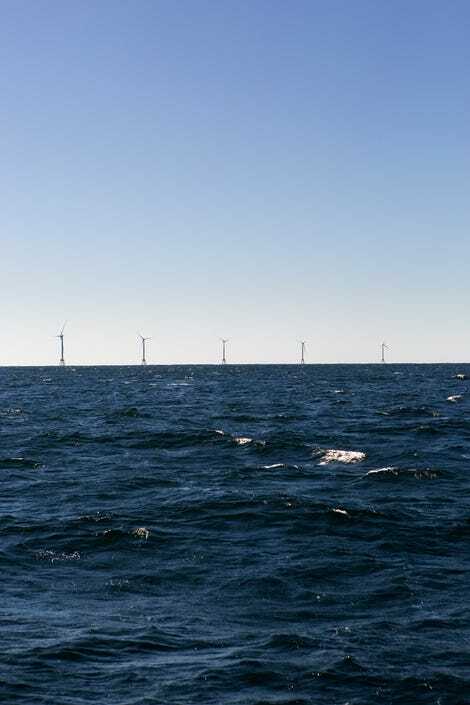 Anchored to the seafloor twenty miles south of Rhode Island, the five turbines comprising Deepwater Wind’s $300 million Block Island Wind Farm wereerected over the summer. The blades were unlocked several weeks back, and in November, they’ll start generating electricity—30 megawatts (MW) at peak capacity, which is enough to power 17,000 homes. To the dozens of men and women present on today’s boat tour—executives from Deepwater Wind, Rhode Island state politicians, labor leaders and environmentalists—the wind farm is a sign of things to come. If the country likes what it sees, offshore wind could become a cornerstone of America’s bid to wean off fossil fuels. Proponents imagine a future where coastlines from the Carolinas to Maine are lined with thousands of turbines, siphoning energy out of fierce north Atlantic winds and delivering carbon-free power to millions. But not everyone wants that future, and even those who do acknowledge the enormous political, economic, and technological hurdles we need to overcome before it arrives. It’s a beautiful idea, that the solution to our oil and gas addiction is already at our fingertips. That, with a concerted effort, we could halt climate change by tapping the strong, sustained winds gusting just offshore—an endlessly renewable energy source. The United States has some of the best offshore wind resources in the world. According to the Department Energy, our “technical offshore potential” is more than 2,000 gigwatts (GW) of power, which translates to double the electricity generated by all oil, coal, and gas-fired power plants last year. Harnessing that full potential would take a mind-boggling number of turbines, but even a fraction of the energy contained in stiff offshore breezes could go a long way toward meeting high power demands along densely populated coastlines. The northeast, with its fair weather and shallow continental shelves, is considered the ideal place to get started. “The resource is enough to run all electrical needs for all coastal states from Massachusetts to North Carolina, and much more,” says Willet Kemptom, a professor at the University of Delaware’s School of Marine Science and Policy. Some of the technology we need already exists. Thanks to decades of government incentive programs, offshore wind is taking off in Europe, with turbine costs falling fast as production becomes more industrialized. The offshore wind industry still only accounts for 1.5 percent of the EU’s electricity production, but with three thousand turbines producing 41 terawatt-hours of energy last year, it’s nothing to sniff at. The first offshore wind project to receive serious vetting in the United States was Cape Wind, a $2.6 billion proposal to build 130 turbines in the Nantucket Sound off Cape Cod. But after receiving state and federal approval back in 2009 and 2010, the project was held hostage for years by an opposition movement spearheaded by a Koch brother and backed by Mitt Romney, among other wealthy and well-connected residents of the Cape. Not only do Cape Wind’s opponents say the project would cause significant “visual pollution,” they insist it will raise the cost of electricity rather than lower it. Last year, after endless construction delays, Cape Wind lost its power purchase agreements with utility companies. It now seems unlikely the project will ever break ground. Perhaps it’s no surprise that the first offshore wind farm to succeed where Cape Wind failed is much smaller, and addresses a much more glaring energy issue. Lacking a direct connection to Rhode Island’s power grid, the 1,000 year-round residents of the sleepy community of Block Island have, for decades, been forced to burn diesel fuel shipped over from the mainland—a dirty and extremely pricey way of keeping the lights on. Now that Block Island is producing power, it’s been integrated into the system. In June, utility company National Grid—which is buying electricity from Deepwater Wind and selling it to customers throughout the state—installed a submarine cable connection linking the wind farm and the nearby community to the mainland. The clean energy Block Islanders will start buying this month isn’t exactly a bargain: the first year power-price is 24 cents per kilowatt hour, compared with an average of 14 cents per kilowatt hour throughout the state. But it’sabout 40 percent less than the cost of diesel. The island will also be avoiding an estimated 40,000 tons of carbon emissions per year, and as an added bonus, that new submarine cable includes a fiber optic connection. For the first time, residents will have high-speed internet. Despite the project’s apparent benefits, not everyone on Block Island is thrilled about it. Some residents see the wind farm as a political charade, arguing that they are bearing the burden of above-market energy costs to enrich private investors, and that the long-term savings will be minimal. As with Cape Wind, opponents feel they are trading environmentally-destructive carbon pollution for economically-destructive visual pollution. “No one can argue that the loss of [Block Island’s] viewshed will not harm my business and any other on the Island,” Block Island grocery store owner Mary Jane Balser wrote in a letter to the Block Island Times in 2014. 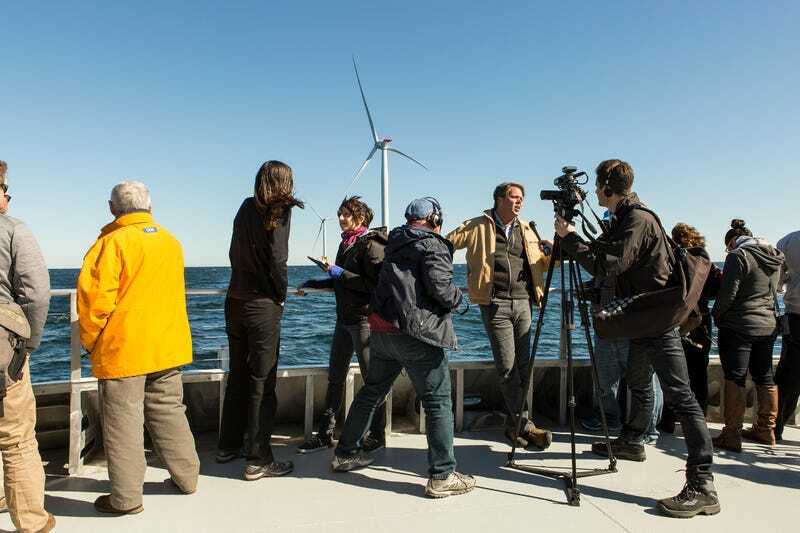 Matthew Morrissey, Vice President of Massachusetts for Deepwater Wind, says that the controversy over the Block Island Wind Farm is relatively small. After all, Block Island’s town council and resident’s association supported the project, as did recent Rhode Island governors, state senators, environmental groups, labor union leaders, and the Obama administration. At this point, only time will tell if he’s right. As our boat weaves between turbines like a guppy amongst whales, I learn that there’s far more to the structures than meets the eye. Designed by French energy company GE, Block Island’s 6 MW, 589 foot-tall Haliade turbines employ new “direct drive” technology, which replaces the rotating gearbox of older models with a giant, permanent magnet generator. “This reduces mechanical systems inside the machine,” GE project director Eric Crucerey says. “Fewer pieces mean less maintenance.” In fact, if all is running well, nobody will need to be inside the turbines at all. If the nacelle includes the brain and muscles of the turbine, the tower—an enormous metal tube built of three 200-ton sections of cast steel—is its backbone. The Block Island Wind Farm towers were assembled over the summer with the help of Brave Tern, an aircraft carrier-esque Norwegian vessel that can lift a gigantic crane hundreds of feet out of the water on four enormous stilts. The tower, in turn, rests on a 1,500-ton steel jacket foundation, which is anchored to the seafloor 100 feet down. The turbines are hardy things, designed to endure everyday wind and waves, but also powerful storms and even hurricanes. They start spinning to generate power at wind speeds of approximately 6.5 mph, and from there, run merrily along until wind speeds approach that of a strong tropical storm. “When wind speeds get up to 55 miles per hour, we will feather the blades so they’re not creating friction with the wind,” Morrissey says. With the blades in a safer configuration, Morrissey reckons they can withstand gusts of over 200 mph. “They’re insured, which says something,” he notes. Under normal conditions, electricity generated by a turbine is transmitted via cables down the length of the tower to the seafloor, then to a substation located on Block Island. From there, it’s supplied to the island’s residents and fed back into Rhode Island’s grid. As Catharine Bowes of the National Wildlife Federation points out, one turbine is needed to power Block Island, even at peak summertime usage (approximately 4 MW). “All of the surplus goes to the mainland,” she says. How big that surplus is depends on how fast the wind blows and how well the machines perform, something Deepwater Wind will be monitoring closely. On average, Wilhelm says, offshore wind operations run at 45 percent capacity. Land-based wind farms in the Great Plains run at about 33 percent capacity, while solar farms reach capacities of up to 20 percent. In a truly dire situation, a person can sky-dive to the base of the turbine using rappelling gear attached to the helipad. While each of the turbines is designed to operate autonomously and can be controlled remotely, workers will still have to enter them periodically for maintenance. Normally, they’ll take a boat out, scale ladders attached to the jacket foundation, enter at the base of the tower, and take the long elevator ride to the top. But in a pinch, workers can also airlift in and out via a helipad located next to the nacelle. In a truly dire situation, Crucery says, a person can sky-dive to the base of the turbine using rappelling gear attached to the helipad. Similar gear can also be used to exit the turbine from the tower, should the elevator break down. “People need training to be inside this machine,” Crucery says. Indeed, these safety measures serve as a reminder that, while working on a wind turbine is much safer than working on an explosion-prone oil rig or inside a coal mine, clean energy plants are not risk-free. 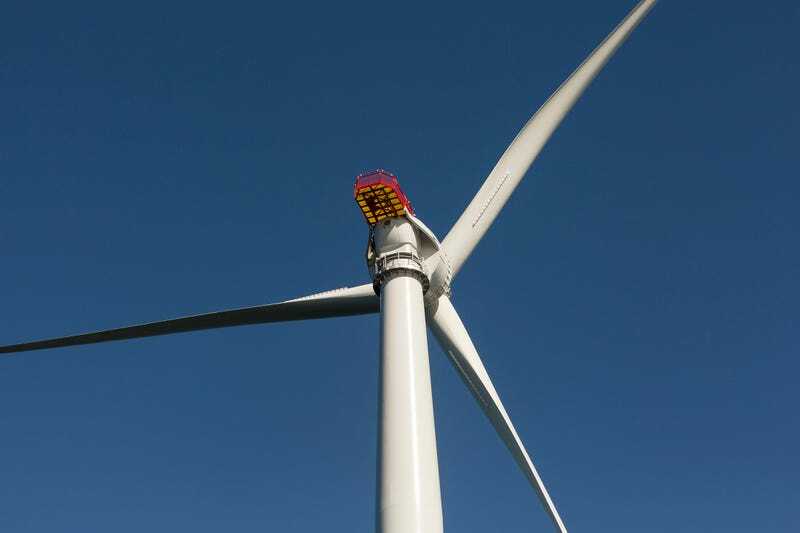 Human accidents involving wind turbines are underreported, but data compiled by theCaithness Windfarm Information Forum indicates that blade failures represent the biggest danger, followed by turbine fires. Bracing myself against winds that could fling me into the sea if I let my guard down, I try to imagine making the six hundred-foot leap out of a flaming nacelle. If Deepwater Wind’s reticence to discuss emergency evacuations is any indicator, I’m not the only one who finds the scenario a bit frightening. Job creation is often touted as a reason to support wind energy, even if you don’t care about climate change. The reality is that switching to clean power at industrial scales is going to require industrial-scale manufacturing and development, such as we’re starting to see in Europe, where most of the Block Island Wind Farm’s parts were built. The DOE estimates that an offshore wind industry could support 600,000 new jobs on US shores by 2050. Rhode Island may be first out the gates on offshore wind, but other states are poised to catch up quickly. 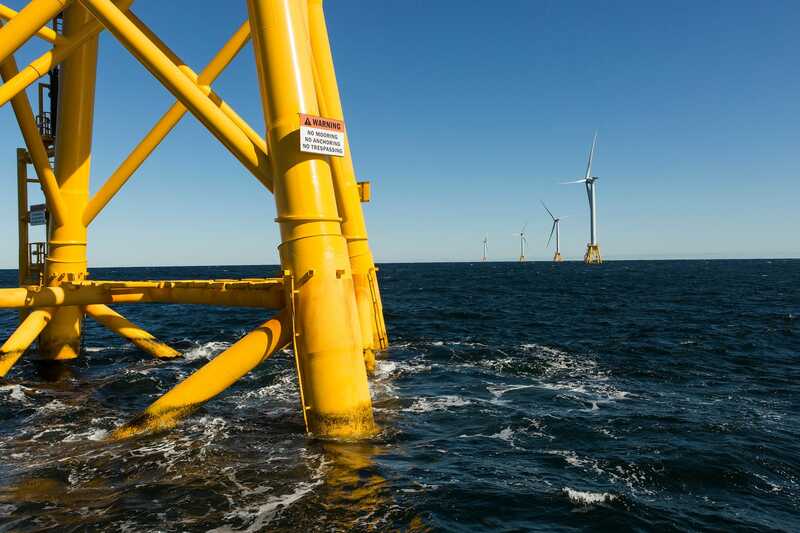 Over the summer, Massachusetts passed a bill that will require its utilities to purchase 1,600 MW of electricity from offshore wind farms by 2027. The state of New York, meanwhile, recently approved a Clean Energy Standard that compels New York City to draw 50 percent of its power from renewable sources by 2030. Will the industry catch on elsewhere in the northeast? According to Wilhelm, electricity from offshore wind is still about double the market cost, “which is kind of discouraging,” he admits. States that haven’t been eager to pick up some of that cost may be waiting for a signal from the feds—say, a tax creditsimilar to the soon-expiring production tax credit that’s driven the price of land-based wind power down. Of course, national energy policies depend entirely on who we elect into office this November and in the years to come. There’s also the issue of actually using the seafloor. The Obama administration has designated 11 wind energy areas in the northeast, but many more are needed for offshore wind energy to make a dent in our carbon pollution. State governments and energy companies need to do environmental vetting, to ensure they aren’t building on top of sensitive habitats, or during key migration periods for birds and whales. These processes take time. 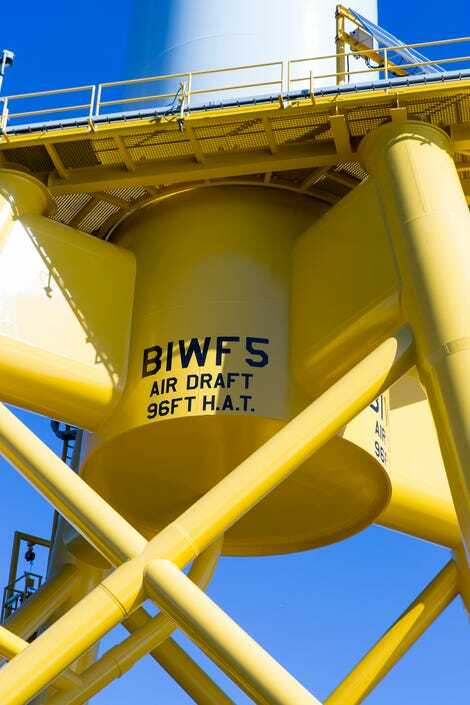 Deepwater Wind, for its part, has already secured rights to another lease area, about 20 miles east of the Block Island Wind Farm, and is in the process of negotiating a power purchase agreement with Long Island for the first phase of the site’s development, the 90 MW South Fork Wind Farm. If the deal is approved, construction could begin as soon as 2019. As our boat crests around the craggy southeastern shore of Block Island, past cliffs and harbors dotted with picturesque New England homes, the turbines recede from view. The blades, which we could see swaying lazily in the breeze from directly underneath, now appear suspended in place against the brilliant blue horizon. Looking back on the wind farm from far away, I’m once again reminded what a small step this is compared with what’s needed to transform our grid and prevent dangerous climate change. But small steps are how new ideas take root. Whether these turbines are the first ambassadors of our brave new energy future, or a curious blip in the history books, I can’t yet say. We’ll have to see how the winds blow.